Lovin That! 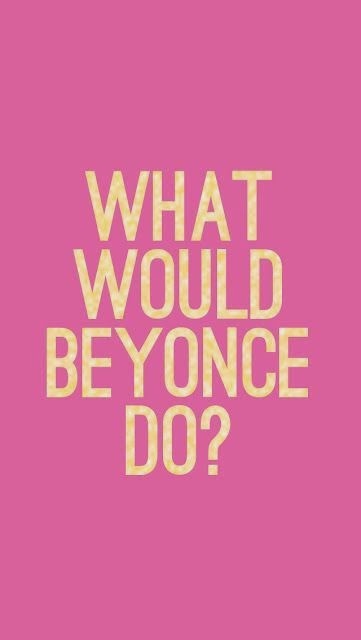 : What Would Beyonce Do? I kinda love this. The reason I love this doesn't really have a lot to do with being a fan of her music, though I do really like that 'drunk love' song. It's more to do with the fact this girl is gotta going on! I watched part of her documentary a few months ago and to be honest was pretty fascinated with her. Not only is she mega, mega, mega successful but she gets the inner stuff as well. One of my favourite things she said was that life is like a puzzle. People and things come into your life for a reason and if you're paying attention it becomes so easy to see why and make the next move or decision. And when you look back you see how this puzzle all came together. It's how you get into the flow of life. I'm trying to be more aware of those 'puzzle pieces' these days and where they show up. And, if that doesn't work just say...what would Queen B do?